“You are beautiful in life and in death.” These were the words used by Sayyiduna Abu Bakr (may Allah be pleased with him) on visiting the Holy Prophet Muhammad (peace and blessings be upon him) while he lay in his house, passed away. The month of Rabiul Awwal has come and passed by us. This is the month in which the Prophet (peace and blessings be upon him) was born. At a time in which the whole world was engulfed in darkness and evil, out came a beacon of light, a beacon of hope, the light of which shone brightly onto the hearts of mankind. That beacon of light was in fact the blessedness of the Prophet (peace and blessings be upon him). He was sent to bring mankind from darkness into light. No sunrise or sunset, night or day, can ever be compared to the luminous nature of the Prophet (peace and blessings be upon him). His message lives on, his remembrance lives on. History bears witness to his greatness. Many books have been written in his praise, many speeches given in his honor. Yet more importantly, having the flame of his love burning in our hearts is a state we must all aspire to reach. The companions of the Prophet (peace and blessings be upon him) gave their lives for his cause, resulting in the eternal pleasure of Allah Almighty. Allah is pleased with them and they are pleased with Allah Almighty. Not only did they strive to please the Prophet (peace and blessings be upon him) but they understood that the link between themselves and Allah Almighty was the Prophet (peace and blessings be upon him). And in order to please Allah Almighty they needed to please His Prophet and implement the Sunnah (his tradition) through external and internal obedience and various practices. One who practices the Sunnah to the best of his or her ability has in fact achieved part of what the companions strived to achieve. Whenever the companions remembered him they would weep. 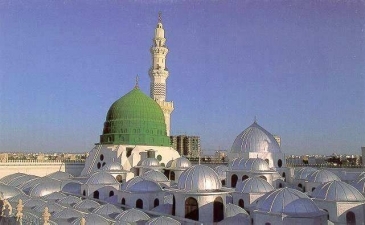 Once Sayyiduna Bilal (may Allah be pleased with him) returned to Madinatul Munawwarah after the demise of the Prophet (peace and blessings be upon him). The grandsons of the Prophet (peace and blessings be upon him) requested him to give the Athaan as he would do during the life of the Prophet. He started the Athaan and when he reached the name ‘Muhammad’ he wept profusely, as did those around him due to the memory of the Prophet (peace and blessings be upon him). Bilal (may Allah be pleased with him) could not bear the demise of the Prophet, just as all the companions could not. How often do we weep upon his name being mentioned? We set aside time for friends and family but what about setting aside time to remember the Prophet (peace and blessings be upon him)? The Prophet (peace and blessings be upon him) said, “the one who recites the most salutations upon me is closest to me in the hereafter.” Rather than debating on how we should remember him, we should all individually strive to increase our love for him by sending salutations upon him as much as possible, as well as by acting upon his Sunnah. How can one claim to love the Messenger whilst rejecting his Sunnah? It is blasphemous to think of or to commit such rejection. Love for the Prophet should be an everyday natural feeling, not an imposed obligation. Every day should be spent in his remembrance. Not once a year, or once a week. Nothing is better than decorating our hearts with his love. Decorating mosques and homes in his honor has no meaning if his Sunnah is rejected regularly. Love is an emotional feeling. Too much of it can cause harm and too little bears no weight. That is why our love for him should be balanced according to the Quran and Sunnah. With this I pray that Allah enable us all to increase in love for His Prophet in our hearts, minds, bodies and souls. Truly the sun of his remembrance can not and shall never set in our hearts. May the peace and blessings of Allah be upon His beloved Prophet Muhammad (sallallahu alaihi wasallam).